If you participate in the public traffic, you must adhere to the rules of the road traffic licensing authority § 67 (German Road Traffic Registration Regulations). It regulates which lights are required for bikes in the road traffic. The ADFC also advises extensively in regard to the subject of bike lamps and what one needs to know regarding reflectors, tail lights, headlights, spoke reflectors and so on. If you fail to observe the lighting prescriptions for bikes, you have to reckon with having to pay a penalty. The lighting on the bike should be important to every biker without any question, since one should not make any cutbacks if it concerns the safety. Safety lights are just as required in the road traffic as is a helmet. All bike lamps tested according to the StvZO (road traffic regulations) carry the German test mark, the certification from the German Federal Motor Transport Authority (KBA); here, you should watch out for the code letter K. In the road traffic, the dynamo-operated bike light certainly is still the one which is spread the widest. But here, the biker must pedal quite diligently, meaning he has to expand additional power in order to operate the dynamo. This again is a plus for accumulator and battery-operated bike lights, since they light up even if you do not actively tread the pedal. A reason why the obligation to use dynamos has meanwhile been deleted and accumulator or battery power is allowed as an alternative. Until 2013, a "light machine" (dynamo) was a must have for every bike in the road traffic. You were allowed to use batteries, but only in addition. Now there are new regulations for headlights and tail lights that either a dynamo (at least 3 W rated output, 6 V nominal voltage) or a battery or accumulator-powered permanent lighting (the first mentioned with 6 V nominal voltage) may be used. The biker may choose. The regulations in regard to the lighting on the road bike (up to 11 kg) are also a bit more loose and deviate a bit from the general regulations. In our online shop, you'll find StVZO-approved bike lights as well as lights, which have not been approved and which are intended for your sportive round in field and forest in the evening. Therefore, pay attention to the respective description in the article's text. Which benefits do the accumulator and battery-powered bike lamps, which become more and more popular, provide? First of all such a lamp can be installed and taken off quickly again. Mostly by means of a holding device on the handlebar, you should only consider in advance that you have to charge it sufficiently. If the output can be regulated, you can still ride with reduced light output at twilight, again saving accumulator power and thus extending the life cycle of the accumulator. In the HIBIKE bike light shop, you can buy articles from all the major manufacturers, such as Sigma Sport, Busch & Müller, Exposure Lights, Hope, Lezyne, Lupine or Blackburn. Everything is about lux and lumens, Li-Ion accumulators, light distribution, LED, weight of the lamps and their life cycle. Modern, accumulator-powered LED lamps will hold up during your bike tour problem-free 10 hours and longer. Buy LED bike lights, helmet lamps & tail lights at favourable prices from a large selection. When purchasing, you should familiarize yourself in advance with what you are looking for and for which area of application you need it. For the road (observe the StVZO) or for the sport? How much can the new bike lamp cost? Light sets (lighting systems) most of the times are more favourable in price than buying individual lamps. Which holding system am I looking for? Am I looking for a front lamp with holding device on the handlebar or do I wish to mount it on my helmet. How many LED's, how much lumen output is the lamp supposed to have? 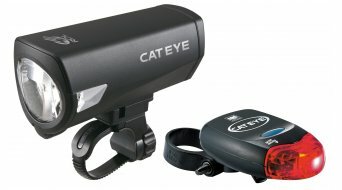 Do I require additional tail lights and reflectors (known as cat's-eyes) on pedals or spokes? Dynamo or accumulator-powered? Battery- / accumulator-powered lighting is small in size and light in weight, thus can easily be stowed in the backpack - should the next tour be longer than expected. Nowadays, waterproof housings and waterproof (rubber) plug connections are no question anymore. Should something break anyway or get lost and you would like to buy a new plug, bulb, replacement cable or a new charging unit for your bike lamp, you'll also find numerous lamp accessories in the lighting shop online. A tip from us: The often tiny small battery lights, such as e.g. the ones known from Knog Frog, are also very popular. Fastened on the jersey, backpack or helmet, these tiny LED lamps in silicone sleeves are very useful. Discover everything regarding the subject of the lighting on the bike here in the shop for bike lamps. Favourable prices and a large selection of brands are awaiting you! Tip:In our HIBIKE-blog Lukas explains the subject of the lighting, just come visit us!